The arm is constructed of stainless steel and rotates 180 degrees around the table. Nylon bushings for smoother movement and has a flip top design. 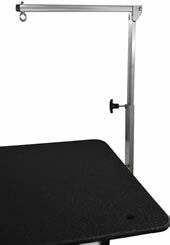 Height adjusts from 8 inches up to 40 inches. Attaches to the table frame for more stability, not the table top. Designed for use with all Groomers Best hydraulic and electric tables. Not made for any other type of tables.